I don't ask questions, I just do. Do you know what Super-Who-Lock is? ...or maybe it's Superwholock or Super Who Lock? I'm not quite sure. 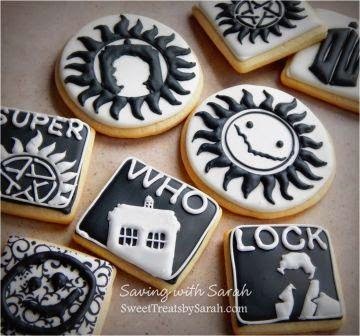 If you're a fan of Supernatural, Doctor Who or Sherlock (or you want them combined) - you might like these cookies. If you're confused go here. Can I have a recipe for these awesome cookies! You have just described me thank you lol.